A health resort known for its waterfalls with medicinal properties set amidst lush green woods. ‘Parisal’ means a boat made of palm fiber ride through river Kauvery will be pleasant experience. Bangalore is the nearest airport, Dharmapuri is the nearest major Railhead 130 km away on the Bangalore – Salem route, Chennai is 350 km from here. 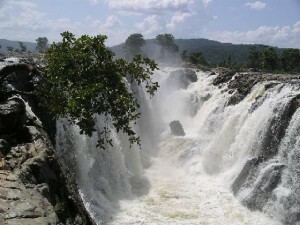 This entry was posted in Hogenakkal, Tamil Nadu and tagged Falls. Bookmark the permalink.